Our multi-instrumentalist, mask and instrument maker Enzo Fina is co-author with Roberto Catalano “Simple Does Not Mean Easy” on the values of tradition, oral history, and peasant culture in Southern Italy and how these experiences inform their duo, MUSICàNTICA. 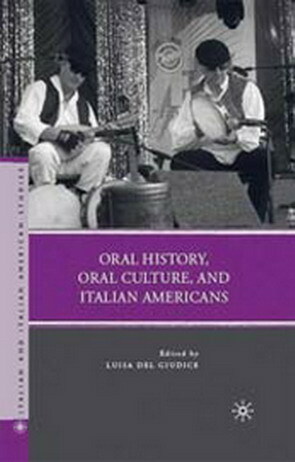 The essay was included in the volume Oral History, Oral Culture and Italian Americans, published by Macmillan. And Enzo and Roberto are on the cover. We both remember those who showed us how to pull a stem of wild oat off the side of the road and by piercing it, make a clarinet. In Sardinia, peasants would cut the flower off a succulent plant known asl ‘ombelicod iVenere or “Venus’s belly,” and by blowing into it imitate various animal sounds; or they could make a whistle by piercing a prune or apricot pit. The list of such prodigious instruments is vast in all Italian regions. Giulio Fara called these objects giocattoli di musica rudimentale (rudimentary musical toys; Fara 1915), and Giovanni Dore gave them the more revolutionary sounding term, ordignis onoritt or “sonorous devices” indeed “weapons” ( Dore 1976).By using a number of these instruments, we celebrate the inventive genius of the oral tradition. We learned a fundamental peasant principle: the most unusual, simplest objects can make the most unexpectedly interesting and complex sounds. By the same token, we learned that objects commonly considered trash could be surprisingly effective from a musical perspective. We make impressive rain sounds with plastic bags, and we involve our audiences in playing soda straws. With a small lamb’s copper bell and a shaker we mimic the chirping of crickets and summer cicadas while volcanic rocks from the island of Filicudi make dry rattles and clacking sounds reminiscent of workers in stone quarries or of peasants clearing fields before planting. We have used thin-cut, large wooden sheets shaken to create the sound of wind, as well as the soft rumble of approaching thunder.